Today marks the end of the third week of the federal government shutdown. This morning, Indiana’s Family & Social Services Administration (FSSA) announced it plans to release SNAP benefits for the month of February early, on January 19th. No SNAP benefits will be issued within the month of February; March distribution remains unknown, depending reserve funds or an end to the shutdown. To help food banks meet the growing need during this extraordinary shutdown, we encourage the public to contribute to Indiana’s food banks. Donations can be made at www.feedingindianashungry.org, Please include a note that the contribution is for shutdown relief and it will be passed along to the food bank serving the donor’s community. The 2018 budget proposed by President Trump would be damaging for the nearly one million Hoosiers facing hunger. The budget makes significant cuts to programs that support millions of Americans who have fallen on hard times, including SNAP (or food stamps), which would be reduced by more than $190 billion over 10 years – a cut of more than 25 percent and resulting in at least 45 billion meals lost. The budget also proposed cuts to the Emergency Food Assistance Program (TEFAP), which is federal commodity food largely distributed through America’s food banks. Any proposed cuts to TEFAP would limit the ability of Feeding Indiana’s Hungry member food banks to provide food assistance throughout the state. Estimates show 33 million meals would be lost nationwide in FY2018 due to TEFAP cuts. The Supplemental Nutrition Assistance Program (SNAP, commonly referred to as “food stamps”) is the cornerstone of the nutrition safety net, providing assistance to low-income Americans to ensure that they can get the nutrition they need. The Supplemental Nutrition Assistance Program (SNAP, formerly “food stamps”) helps millions of low-income Americans put food on the table and provides benefits that are timely, targeted and temporary. More than 300,000 children in Indiana don’t know where their next meal is coming from. Feeding America’s 2017 Map the Meal Gap report is out, and it looks at the hunger rate in every county across the country. The report analyzes factors such as food price variations, food budget shortfalls, poverty and unemployment. It says overall, 1 in 7 Indiana residents is food insecure. Emily Weikert Bryant, executive director of Feeding Indiana’s Hungry, says the hunger rate for children is even higher – at 20 percent or more – in 38 counties in the state. Weikert Bryant says about 7 in 10 Hoosier children are eligible for some sort of nutrition assistance program, but that leaves about 30 percent whose families make too much to qualify. In some cases, she says, the only places they have to turn for help are charitable organizations that distribute free food. The report also finds shortfalls are growing in many families’ food budgets. Weikert Bryant says that means there isn’t enough to stretch from paycheck to paycheck. Weikert Bryant adds a greater effort is needed to make sure that people who are eligible for food assistance apply for and receive it, and she says this is no time for the federal government to cut or restrict eligibility for food programs. Marion County has the highest overall food insecurity rate in Indiana. Hamilton County has the lowest, but Weikert Bryant says there still are 26,000 people in that county at risk of hunger. Feeding Indiana’s Hungry announced the release of Map the Meal Gap 2017, the latest report by Feeding America® on food insecurity and the cost of food at both the county and congressional district level. Map the Meal Gap 2017 reveals that food insecurity exists in every county in Indiana. Overall food insecurity ranges from a low of 9 percent of the population in Hamilton County up to nearly 19 percent in Marion County. The national average food insecurity rate across all counties is 14%. The study also finds that people currently facing hunger are likely falling further behind as they continue to struggle to buy enough food to meet their needs. Food-insecure individuals now face, on average, a food budget shortfall of $15.44 per person each week, up from $14.92 last year. Feeding Indiana’s Hungry is a Partner State Association of Feeding America, a network of 200 food banks that collectively provides food assistance to 46 million Americans struggling with hunger. The eleven member food banks of Feeding Indiana’s Hungry collectively distributed 62.6 million meals to clients across Indiana in 2016 to alleviate hunger. 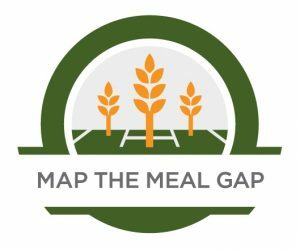 Map the Meal Gap 2017 uses data from the U.S. Department of Agriculture, U.S. Census Bureau, U.S. Bureau of Labor Statistics and food price data and analysis provided by Nielsen (NYSE: NLSN), a global provider of information and insights. The study is supported by founding sponsor The Howard G. Buffett Foundation, Conagra Brands Foundation and Nielsen. 14.4% food insecurity rate in Indiana is estimated to be 950,720 Hoosiers at risk of hunger. Child food insecurity numbers are estimated at 301,990 at 19.1%. County averages range from 12.6% in Hamilton County to several counties to 38 at or above 20%, and several nearing a quarter of children in the county being food insecure, including Fayette, Switzerland, Sullivan, and Wayne Counties at over 23%. Dr. Craig Gundersen, Professor of Agricultural and Consumer Economics at the University of Illinois, Executive Director of the National Soybean Research Laboratory and a member of Feeding America’s Technical Advisory Group is the lead researcher of Map the Meal Gap 2017. A summary of the findings, an interactive map of the United States, and the full report are available at map.feedingamerica.org. Join the conversation about Map the Meal Gap 2017 on Twitter using #MealGap. More than 7 million, or 40 percent, of seniors eligible for the Supplemental Nutrition Assistance Program (SNAP) have not applied, and the numbers are even lower in the Hoosier State. During Older Americans Month, the National Council on Aging has an effort under way to close the “SNAP Gap,” to get those folks access to healthier food, instead of relying on food banks. Thirteen percent of Indiana’s food-bank clients are more than 60 years old. Emily Weikert Bryant, executive director of Feeding Indiana’s Hungry says many seniors aren’t getting healthy food they need because they just can’t afford it. Weikert Bryant says a quarter of Indiana households have one family member who’s over 60, and many of those homes have small children as well. The average amount a senior who does collect SNAP gets just $110 a month. She says that means they have just over a dollar to spend on each meal. Many seniors face barriers because they don’t have a computer or transportation to sign up for benefits, and many think they aren’t eligible. Weikert Bryant says we should pitch in and help them. 1963 when President John F. Kennedy designated May as Senior Citizens Month. It was later renamed Older Americans Month (OAM) and every president since Kennedy has issued a formal proclamation that the entire nation pay tribute to older persons and their contributions to our communities. The 2016 OAM theme is Blaze a Trail. The Administration for Community Living is raising awareness about important issues facing older adults and highlight the ways that older Americans are advocating for themselves, their peers and their communities. The Feeding America nationwide network of food banks serves seven million seniors, the 1 in 12 seniors who face hunger in our country. Additionally, nearly 750,000 seniors volunteer each month at Feeding America network food pantries and meal programs across the country. Food insecurity is particularly detrimental to seniors because of their unique nutritional needs related to aging and medical conditions. As such, we know seniors facing hunger are at increased risk for chronic health conditions like depression (60%), heart attack (53%), asthma (52%) and congestive heart failure (40%). Through thoughtful and innovative programs designed to address the special and unique challenges that seniors face, the Feeding America network provides 563 million meals to seniors (age 60+) each year. Charitable food assistance alone cannot solve senior hunger. The federal nutrition programs that reach seniors, including SNAP, the Commodity Supplemental Food Program (CSFP), and senior congregate and home-delivered meals are critical supports for low-income seniors facing hunger. This year, Feeding America and partner organizations have come together to shine a light on the fact that seniors, more than any other age group, do not take advantage of SNAP benefits. Nationally, only 41 percent of seniors who are eligible to receive SNAP are actually enrolled in the program, compared to the larger population where 83 percent of individuals who are eligible are taking advantage of benefits. In Indiana it’s even lower; only 33 percent of eligible seniors are participating in SNAP. 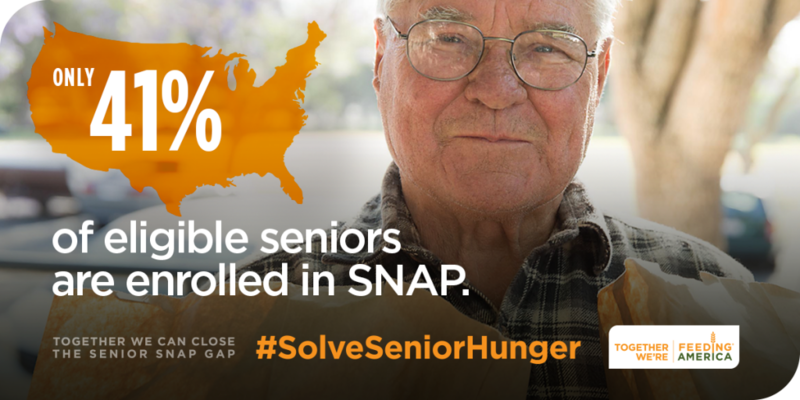 During Older Americans Month 2016, we’re joining together to help #SolveSeniorHunger by closing the Senior SNAP Gap. Senior SNAP gap state-level information is available thanks to the National Council on Aging (NCOA). Together, we can give back to those who have given us so much of their time, hard work and wisdom. Join us in raising awareness for older Americans who struggle with hunger, so we can work toward solving senior hunger. Visit org/SolveSeniorHunger to learn more about the issue and find resources to help raise awareness. Feeding Indiana’s Hungry announced the release of Map the Meal Gap 2016, an annual study by Feeding America that details food insecurity rates in every county and congressional district in the United States. The study reveals that 15 percent of the population in Indiana is food insecure – 1,009,710 people, including 335,410 children. Food insecurity is the U.S. Department of Agriculture’s measure of lack of access, at times, to enough food for an active, healthy life for all household members. Using county data from the five-year period of 2010 to 2014, Map the Meal Gap 2016 is the first Map the Meal Gap report with post-Great Recession county food-insecurity estimates. This year’s report found that nearly 15 percent or approximately one in seven people in the United States struggles with hunger at some point during the year. While the rate has decreased since 2011, the prevalence of food insecurity across counties remains historically high since 2008, and has not yet returned to pre-Great Recession levels. • The county with the lowest overall food insecurity remains Hamilton County at 9.4 percent or an estimated 27,150 individuals. • The highest level of food insecurity is in Marion County at 19.4 percent or an estimated 177,940 individuals. • The highest child food insecurity rate is found in Fayette County at 26.1 percent or an estimated 1,430. • The lowest child food insecurity rate is found in Hamilton County at 13.5 percent, or an estimated 11,470 children. • 32 percent of Indiana’s food insecure have income above 185 percent of the Federal Poverty Level and are being served only by charitable hunger relief efforts as they are ineligible for federal nutrition programs. Map the Meal Gap 2016 uses data from the U.S. Department of Agriculture, U.S. Census Bureau, U.S. Bureau of Labor Statistics and food price data and analysis provided by Nielsen (NYSE: NLSN), a global provider of information and insights. The study, commissioned by Feeding America, is a detailed analysis of the nation’s food insecurity. “This new research documents the pervasiveness of hunger in every community in our nation. While the economy has improved and unemployment rates have declined, many people are still struggling to access adequate amounts of nutritious food for their families,” said Diana Aviv, CEO of Feeding America. The study is supported by founding sponsor The Howard G. Buffett Foundation, ConAgra Foods Foundation and Nielsen. The lead researcher is Dr. Craig Gundersen, Professor of Agricultural and Consumer Economics at the University of Illinois, Executive Director of the National Soybean Research Laboratory and a member of Feeding America’s Technical Advisory Group. This is the sixth consecutive year that Feeding America has conducted the Map the Meal Gap study. 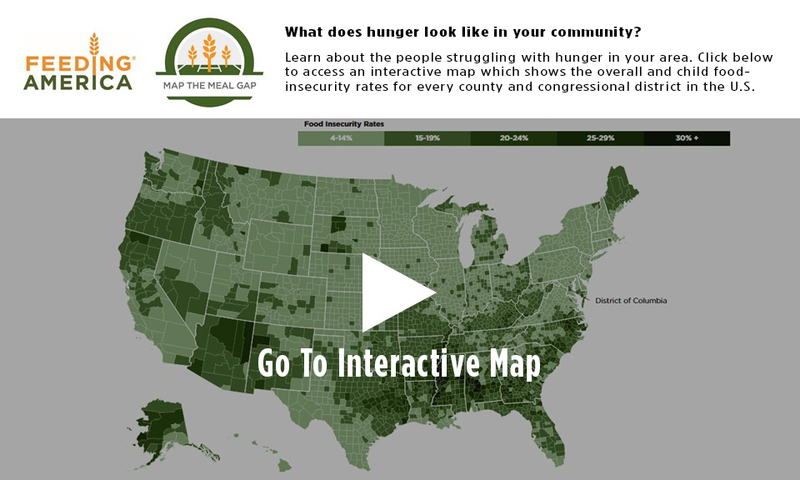 The Map the Meal Gap 2016 interactive map allows policymakers, state agencies, corporate partners and individual advocates to develop integrated strategies to fight hunger on a community level. A summary of the findings, an interactive map of the United States, and the full report are available at www.feedingamerica.org/mapthegap. Join the conversation about Map the Meal Gap 2016 on Twitter using #MealGap. More than 48 million Americans – including 1.1 million Hoosiers – struggle with food insecurity. That’s why The Great American Milk Drive is helping to make the season brighter for families facing hunger with the gift of nutrient-rich milk. Milk isn’t just a drink—it’s a nutrient powerhouse providing 9 essential nutrients, including 8 grams of high-quality protein in each 8 ounce serving. 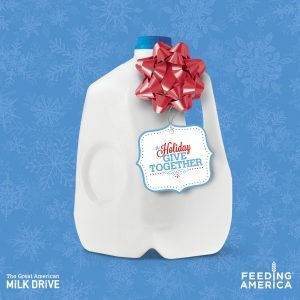 You can be an angel for a family in need in Indiana and help to deliver a gallon of milk, including its high-quality protein, when you support of The Great American Milk Drive this season. Visit Walmart this holiday season and purchase any 2 bags of M&M’s candies (9.4oz or larger) and up to a gallon of milk will be donated to The Great American Milk Drive. On average, food bank clients receive the equivalent of less than one gallon of milk per person per year, leaving many families with limited access to milk’s essential nutrients, including 8 grams of high-quality protein. The Great American Milk Drive is the first-ever national program to help deliver highly desired and nutrient-rich gallons of milk to hungry families who need it most. To date, more than 6.7 million servings of milk have been delivered as part of The Great American Milk Drive and Feeding America’s commitment to help families get much-desired nutrient-rich milk. Donations are also accepted at milklife.com/give, and for as little as $5 at milklife.com/give, you can be an angel for a family in need in your community by helping to deliver a gallon of milk to their table. By entering your zip code, you can ensure that the milk is delivered to a local Feeding America member food bank in your area. Feeding America is a nationwide network of 200 food banks that leads the fight against hunger in the United States. Together, we provide food to more than 46 million people through 60,000 food pantries and meal programs in communities across America. Feeding America also supports programs that improve food security among the people we serve; educates the public about the problem of hunger; and advocates for legislation that protects people from going hungry. Individuals, charities, businesses and government all have a role in ending hunger. Donate. Volunteer. Advocate. Educate. Together we can solve hunger. Visit www.feedingamerica.org, find us on Facebook or follow us on Twitter. The Milk Processor Education Program (MilkPEP), Washington, D.C., is funded by the nation’s milk companies, who are committed to increasing fluid milk consumption. The MilkPEP Board runs the Milk Life campaign, a multi-faceted campaign designed to educate consumers about the powerful nutritional benefits of milk – with 9 essential nutrients, including high-quality protein, in each 8 ounce glass. For more information, go to milklife.com. Campbell Ewald is creative agency for the Milk Life campaign – from America’s milk companies. National Dairy Council (NDC), the non-profit organization funded by the national dairy checkoff program, is committed to nutrition education and research-based communications. NDC provides science-based nutrition information to, and in collaboration with, a variety of stakeholders committed to fostering a healthier nation, including health professionals, educators, school nutrition directors, academia, industry, consumers and media. Established in 1915, NDC comprises a staff of registered dietitians and nutrition research and communications experts across the country. NDC has taken a leadership role in promoting child health and wellness through programs such as Fuel Up to Play 60. Developed by NDC and the National Football League (NFL), Fuel Up to Play 60 encourages youth to consume nutrient-rich foods and achieve at least 60 minutes of physical activity every day. For more information, visit www.NationalDairyCouncil.org or follow @NtlDairyCouncil on Twitter. Feeding Indiana’s Hungry, a Partner State Association of the Feeding America® nationwide network of food banks, will observe Hunger Action MonthTM – a nationwide initiative designed to mobilize the public to take action on the issue of hunger and join the movement to help end hunger. Hunger advocates from Indiana and across the country are working together this September to shine a light on the issue of hunger and the 1 in 6 people who face hunger in America – including more than one million Hoosiers. The Feeding America network of food banks also is participating in the new SpoontemberTM online initiative. To get involved, supporters can share a ‘spoon selfie’ or video of themselves balancing a spoon on their nose – a utensil that is most often used to prepare and provide food for others – and challenge friends and family to join them to generate awareness of the 49 million Americans who may not know where they’ll find their next meal. In addition, many food banks will commemorate Hunger Action Day®, which will be held Thursday, September 3. Hunger Action Day is an opportunity for the country to learn more about how hunger affects their community. Click here to find Hunger Action Day and Hunger Action Month events at regional food banks. Individuals can also help show their support for hunger relief and Spoontember by joining the Hunger Action Month Thunderclap on Hunger Action Day, Thursday September 3, at 12pm EST. By visiting the Hunger Action Month Thunderclap page, advocates can synchronize a Thunderclap Facebook and Twitter message to be shared in tandem with thousands of others to raise awareness about domestic hunger.